I'm fascinated with fascinators. They can be oversized or subtle, dramatic or elegant, worn as part of a hat or a viel, or fastned directly to your hair. I'm also in love with vintage brooches (if you don't know that by now, you obviously haven't taken a look at my Etsy shop, where I sell the overflow of my collection). So when I got invited to a formal, I decided to make a feather fascinator starring a vintage bird brooch. I love the way the bird's wings arc back, so I wanted to make the feathers look like an extension of the wings. I also tried to echo the oversize crimson rhinestones by adding a few red feathers to the shimmering green ones. Whatever brooch you use, whether a bird or something geometric, making a feathery fascinator couldn't be easier. You can make one too. Place the brooch on top of the clip and arrange the feathers so that they line up with the design elements of the brooch. Carefully slide the clip out from under, leaving the feathers in place on the table. Wrap one end of the wire around the inside edge of the beak clip to secure it. Pull out the leftmost feather (or feather bundle), and wrap it onto the top of the clip, bringing the wire back up through the center of the clip. Repeat with the remaining feathers. Then simply clasp the brooch onto the piece (for a more permanent result, you can glue the brooch in place if you don't mind damaging it). A friend of mine just had a baby shower, and decided to have a dessert bar. 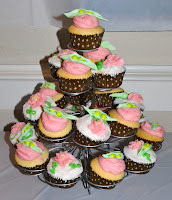 She's having twins, and the shower theme was, "Two Peas in a Pod." 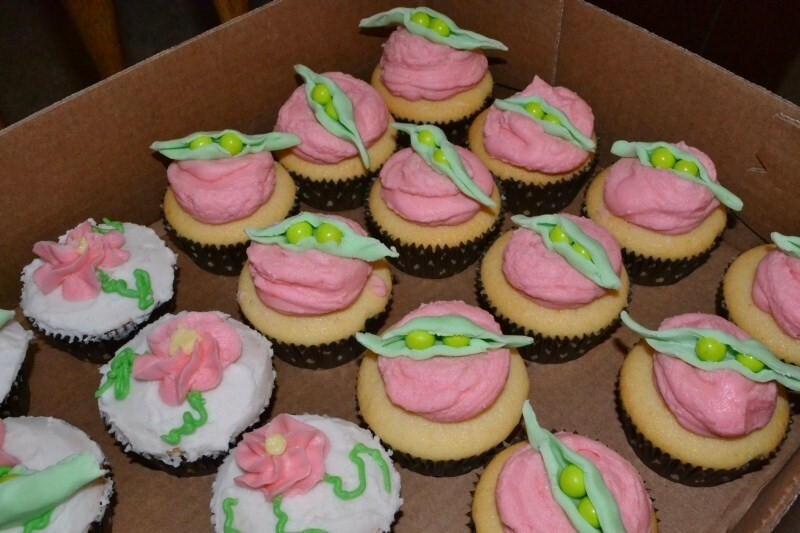 I was asked to make a batch of cupcakes, and I had a vague recollection of seeing a cupcake design with a fondant pea on it. I decided to make my own version of this, frosting half of the cupcakes with a mound of pink buttercream and adorning each with a single pea, then frosting the other half with a layer of white buttercream and stylized pea flowers. 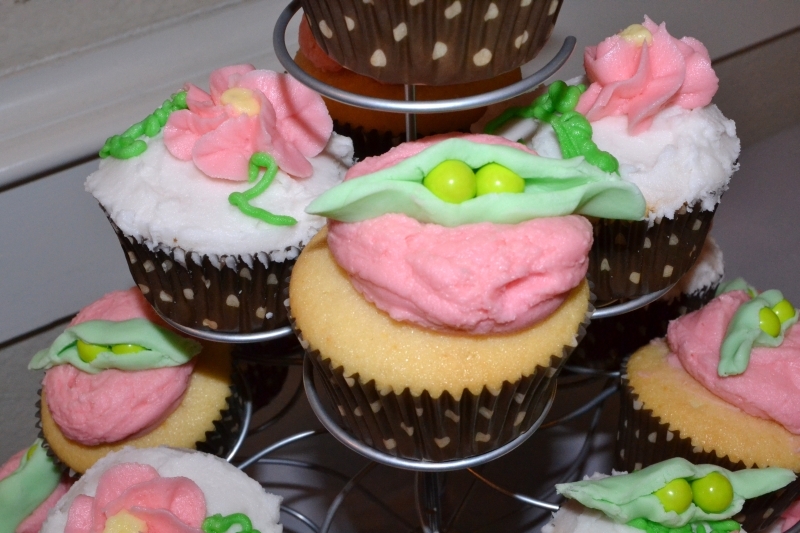 (No, they aren't botanically correct, but I was going for quick and cute. The fondant peas were easy to make. You just roll it out, then cut leaf shapes with a butter knife. Hold the shape in your palm and place two candies (I used Sixlets, but green Skittles would work just as well. Fold the leaf in half and press it gently together, leaving part of the edge open so you can see the front part of the candies.